Mangaluru, May 01, 2018 DHNS: Dakshina Kannada has topped the list of districts in the II PU examination results, with 91.41%. It had secured second position in 2016-17 by registering 89.92%. The district was in top position for three consecutive years, with 90.48% in 2015-16, 93.09% in 2014-15, 86.04% in 2013-14. Ankitha P, of Govinda Dasa PU College, Surathkal secured the second rank in Science with 595 marks. She scored 100 in Physics, Statistics, and Chemistry, Maths and Sanskrit—99, and English—97. Ankitha is interested in music and singing. “I used to participate in sports and singing competition till Class X. I continue to sing in my free time,” she added. Her father Prasad said, “We are very proud of her. She has worked hard to excel.” She studied in Delhi Public School, Surathkal till Class X. She writes English poetry and is also a national-level chess player. She is also a multi-linguist and well-versed in Rajasthani, Marwari, Hindi, English, Kannada languages and understands Tulu as well. Both her parents Atul Surana and Deepali Surana are financial advisers. Bindiya L Shetty of Govinda Dasa College, Surathkal, scored 591 marks (Science) and is fifth in the state. She had scored sixth rank in SSLC. She is the daughter of Leeladhar Shetty and Sujatha Shetty, from Katla, Surathkal. Sukanya Kamath of SDM College with 589 marks (Commerce) secured sixth rank. Her marks are: Economics, Statistics and Business Studies—100, Accountancy—99, Kannada—97 and English—93. Sri Sathya Sai Lokaseva PU College, Alike secured 100% results (Science). Out of the 91 students, 73 passed with distinction and 18 with first class. For the Commerce and Arts streams, of the 73 students 35 passed with distinction. Subrahmanya Beede has scored 591 (Science), followed by Rajath Bollulli 589 (Science), Anjan Kanduraya P 589 (Science), Sathwik 588 (Science) and Pramod Kumar Patil 588 (Science). Bharagav and Anarghya Suvin secured 588 (Commerce). Harshith S has scored 559 (Arts). SDM Residential College, Ujire has secured 100% results (Science), Anugraha PU college, Ujire secured 100% (Commerce and Arts). Boscoss PU College, Mangaluru also secured 100%. 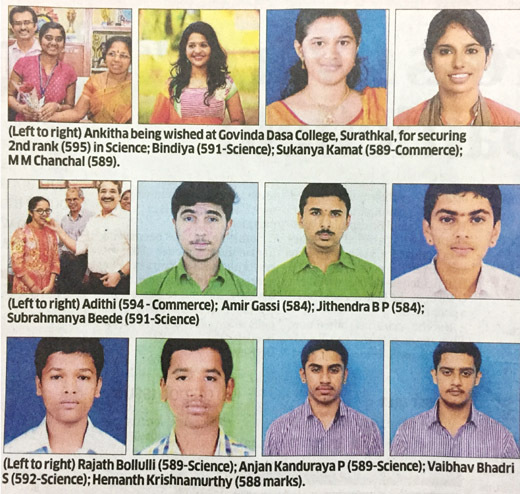 Jithendra B P (584), Amir Gassi (584), Sreyas Bharadwaj (581) are the toppers of the college. Out of the 8,517 students who wrote in Kannada, 6,584 have passed, thus registering 77.3 pass percentage. A total of 1,981 of the 2,380 SC students passed. And 1,140 of the 1,340 ST students also passed. Excellent PU College, Moodbidri secured 99.4% pass. Vaibhav Bhadri S 592 (Science) is ranked fifth in the state, while Hemanth Krishnamurthy is on the ninth rank with 588 marks. Out of the 370 students, 181 passed with distinction and 180 with first class. Niharika Shetty and Roydan Menezes have secured 585 (Commerce). St Aloysius PU College secured overall 98.51% results. Among the toppers Neha K M and Sandria Ann D’Souza scored 588 (Science). Mandara P Shetty scored 588 (Commerce) and Madhupreetha Nayak scored 565 (Arts). “The college secured 414 distinctions,” said Principal Rev Fr Melwin Mendonca. Expert PU College, Kodialbail and Expert PU College, Valachil, together scored a 99.28 pass percentage. A total of 761 students passed with distinction, 89 students scored more than 95% and 432 students scored more than 90%. M M Chanchal became the topper in Kodialbail by scoring 589 marks. Neha P Mane became the topper in Valachil by scoring 588 and scored 100 each in Physics, Chemistry, Mathematics and Statistics. Other toppers in the college are Shreya Bhat (588), Vaishvi P J (587), Harshita R Kumar (587), Yashvita B (587) and Sindhus (586). Kshipraj of Canara PU College, Mangaluru, scored 95.17%. His marks are: Chemistry—100, Biology—98, Physics and Maths—96, Hindi—95 and English—86.